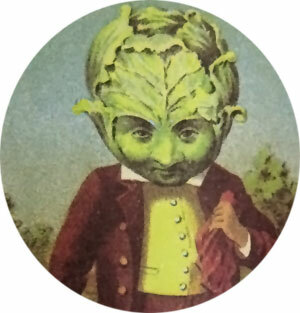 The Grumpy Old Troll: Cabbages! Blind and only semi-intelligent, it is found sometimes at the center of vast patches of wild cabbages in remote seacoast areas. Once per round it can spawn a small angry warrior infant out of the center of its folds, or from the center of surrounding cabbages. It can also blast antagonists with a wave of ignorance and apathy, with results similar to confusion. If defeated and eaten, it is rumoured that great wealth will come to those who dine on its leaves. It is not as dapper as the illustration above, having neither the limbs nor inclination to wear suits. Cabbage-Spawn of Az-Nur: Tough, leathery skin gives them AC 7 despite being naked. Additionally, they are only 1-2 feet tall, and thus receive any armor class benefit due to size differences. Each has 4hd, much in the way cabbage flowers have 4 petals, and attack with either hands or any nearby implements. Due to looking like human babies, any lawful or good opponents must save vs. spells or suffer a -2 to hit these highly aggressive but otherwise adorable minions. When killed, they fall to the ground as a scattering of small cabbage leaves. I saw "Cabbages!" in your title, and had to check it out. Love the picture. The Grumpy Old Troll, another excellent name.